Testing at the China Rehabilitation Research Centre. Credit: Bo Geng. 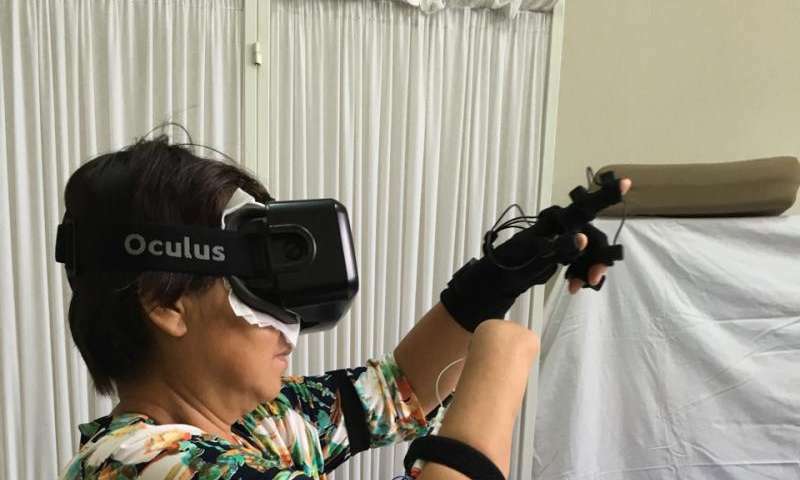 Virtual reality can relieve the sensation of phantom limb pain. A new test devised by researchers at Aalborg University shows that VR technology can trick the amputee's brain into thinking that it is still in control of a missing limb. "The tactile representation of different body parts are arranged in the brain in a sort of map," explains Bo Geng, Postdoc at the Faculty of Medicine at Aalborg University in Denmark. "If the brain no longer receives feedback from an area, it tries to reprogram its signal reception map. That is the most common conception of how phantom limb pain occurs," she says. The method has proven effective in a number of amputees and is the foundation for a new method that has been developed by Bo Geng in collaboration with Dr. Martin Kraus and Master's students Bartal Henriksen and Ronni Nedergaard Nielsen from Medialogy at Aalborg University. By using virtual reality it is possible to create an experience of being present in a three dimensional world where you can move around freely, grab things and interact with them. "The mirror therapy has some limitations because you have to physically sit down in front of a mirror, do the same movement in a confined space with both hands at the same time and keep your eyes on the mirror. The illusion can easily be broken," Bo Geng explains. "With virtual reality there is a much better chance of creating a convincing alternative reality." 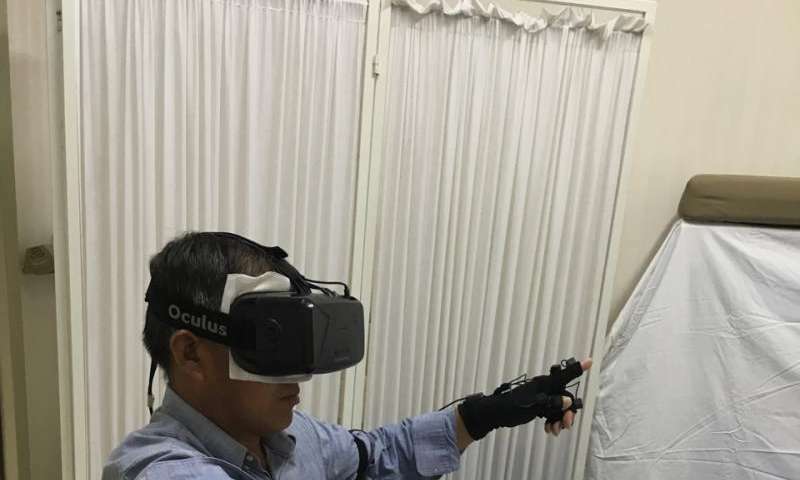 In the new method the patients have to put on VR goggles and a glove. At the same time, small electrodes are placed on the residual limb, known as the stump. In virtual reality, it feels exactly as if you were using both hands. "Even though a person who has had a hand amputated can no longer see it, in many cases, he or she can still feel it. This sensory conflict may be interpreted by the brain as pain. With this new method we try to overcome that conflict by providing an artificial visual and tactile feedback and in that way suppress the pain," says Bo Geng. "Of course, we need to do more tests, but the results so far look promising," Bo Geng says.